Teachworks’ latest addition is the Profile Attachments add-on, which allows you or your employees to attach files to family, student or employee profiles. This can be useful for attaching documents or records about the students, sharing forms with a client or teacher, or any other time you need to save a file linked to a user account. The Profile Attachments add-on allows you to set permissions for your teachers and staff so that they can optionally upload or manage attachments for user profiles that they have access to. 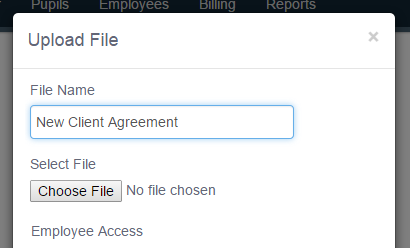 This add-on also allows you to set file-level access for customers, students and employees so that you can either hide the attachments (for internal attachments) or you can make the attachments visible (for attachments that you want to share).